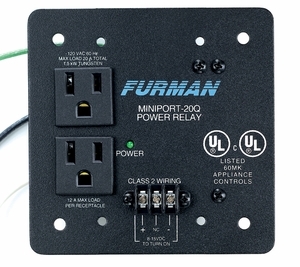 The 20-amp MP-20Q provides a pair of remotely-activated, relay-controlled outlets, set up for mounting in any standard electrical quad box, either directly or with a "mud ring" attached. Due to the space limitations of a quad box, the MP-20Q has a smaller feature set than the MP-20. The MP-20Q has no internal power supply; a maintained 8-15 VDC supply capable of providing 10mA is required to turn on the outlets. This can be supplied by a Furman PowerLink, or an ASD-120.